Are you an adventure-er (totally a word)? Or are you more of a cautious, think-things-through-before-you-do-them type? I used to be the later. Pretty much to a fault. I used to think things through to the point that I usually just never ended up doing those things, or anything for that matter. Boring isn't necessarily the word I want to use, for fear of offending those still living life as the later, but due to a loss of words, I think I might have to settle. I was boring. My life lacked spontaneity. That is until, I met Josiah. Well we've known each other since we were 12, so maybe not when I MET him, but when we started dating. He'll tell you, and it's probably not inacurate, that I was not the kind that you try to make or even change plans with on short-notice. If my plan was to organize the house or go for a run, that plan could not be adjusted. Fortunately after being together for 5 years (almost 6, goodness! ), I have become a much more spontaneous person thanks to Josiah's patience and his education about the great things that can happen when you throw caution to the wind. 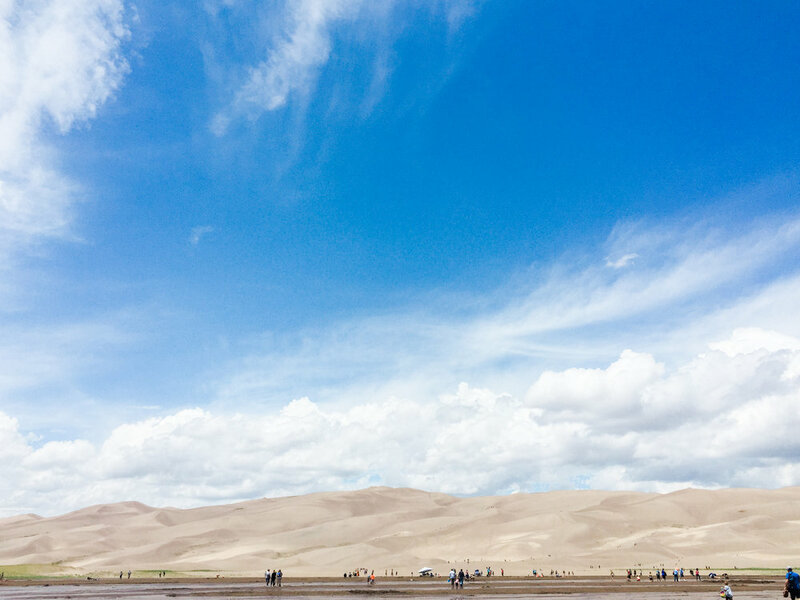 Back in July, when we were living in Denver, we took a trip to The Great Sand Dunes National Park and Preserve. This trip stemmed out of my newfound love for spontaneity and it truly solidified my gratitude for my change of heart. The potentially sketchy hotel, lack of towels (who goes to a beach without towels! ), and lack of sunscreen are all things that probably could have been avoided if we would have planned ahead, but that would have stripped away the impromptu nature of it all and inevitably diminished it's fun by at least half. I may not be quite at the point where I could call myself an adventure-er or swear to never plan ahead, but I can for certain say that I love adventures and the thrill of a change of plans is always, always worth it. This was a trip that Josiah and I will for sure remember. We pretty much just jumped in the car and went. A lot of things didn't go as planned and we weren't nearly as prepped as the other park visitors, but the time that we had together, me staying on the sandboard more times than Josiah (sudden appearance of balance skills, what! ), the views that we took in, and the conversations that we shared in will stay with us. That's the beauty of spontaneity, amidst the unforeseen circumstances are the memories that will last forever. Here are a few pro tips if you are actually going to plan ahead for your Sand Dunes trip, but it's also totally cool if you want to fly by the seat of your pants. 1. Rent a sandboard, because it's so fun and who knows, maybe some balancing skills will suddenly appear. 2. Bring shoes that you can walk in the sand with, because the sand gets HOT. 3. Stop at the Toll House store for a chocolate chip cookie after you return your sandboard and are heading out of town. 4. Bring bug spray because otherwise you'll totally fork over $12 for a tiny bottle at the gift shop. 5. Bring lots and lots of water! 6. Don't go over 4th of July weekend, but if you do, just know that all of the hotels might be booked and you might end up at place that looks like it's straight out of a horror film. 7. Bring towels, because there is water, and you might want to get in it.